Start your morning with chorizo and weenie tacos! The breakfast taco game is smoking hot right now (just ask Los Feliz’s Homestate). 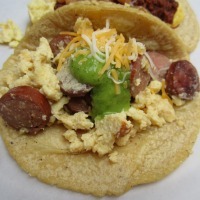 And why not?—who wouldn’t want to start their morning with egg, cheese, and tortillas? Now Guisados, one of the most acclaimed taco purveyors in L.A. is testing out the breakfast market. For the past few weekends, both the Boyle Heights and the Echo Park locations have been serving eight or so varieties of breakfast tacos, along with creamy horchata spiked with Stumptown cold brew coffee, from 8 a.m. to 11 a.m. Highlights this weekend included a chuleta (pork chop) taco drizzled with tomatillo salsa and crema, house-made chorizo with pinto beans, and a “weenie” taco, topped with diced and grilled hot dogs and a bright green salsa verde. Each taco comes with soft scrambled eggs and a sprinkle of grated cheese layered onto Guisados’ trademark thick and moist corn tortillas, made in-house. According to Armando De La Torre Jr., who runs the taco shop with his father Armando Sr., you can expect a few more weekend test runs before Guisados’ new location inside the Spring Street Arcade in Downtown debuts next month. At that point, you can feast on those tacos every morning at the Downtown location, and on weekends at Boyle Heights and Echo Park. Follow Guisados on Facebook or Twitter to keep updated on future breakfast taco test runs.